Durable gray split cowhide leather. Double stitched index finger for strength. Keystone thumb for maximum mobility. Open cuff with shirred elastic back for a secure fit. Open cuff glove material extends below the wrist for an open design, making the gloves easy to slip on and remove. 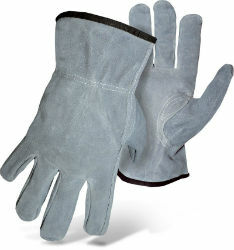 This glove offers good abrasion resistance.